Art, sports, trading cards, and comic books. For me, these worlds often converge due to my varied interests, and my affinity for comic books has been well documented here. A shameless plug for a resource I use, NewKadia.com is an online comic book store with the deepest inventory, discounts, and freebies that I know of for older and out of print comics. The user experience is very easy and you are able to search comics by title, author, genre, year of release and more. From NASCAR to baseball legends, nearly every major sport and many iconic superstars have had their likeness archived in comic form and you can see for yourself the various listings in the sports genre here. Player collectors, in particular, should keep an eye out for these oddball collectibles as they make colorful conversation pieces to any collection while providing an often pleasurable reading experience as well. 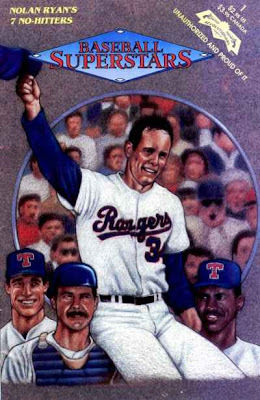 This is one I just picked up of Nolan Ryan. So, do you have any comics in your player collection?